I’m finally getting around to finishing up my write up on my Geothermal HVAC install. In Part 1, I discussed why I was doing it and how I was able to get a quote. For Part 2, I’ll talk about the outside drilling and close loop install. The outide work took about 2 weeks to do and entailed drilling 3 bore-holes 350 ft deep, laying pipe in these holes, digging a trench to connect the holes, drilling into your foundation to bring the pipe into your home, and finally filling the holes and getting rid of extra material. Be prepared for a part of your yard to be destroyed. We required an area about 50’x30′. The bushes in front on the left side of our house all had to be dug up. The holes were about 15′ apart starting from the left side of the house . 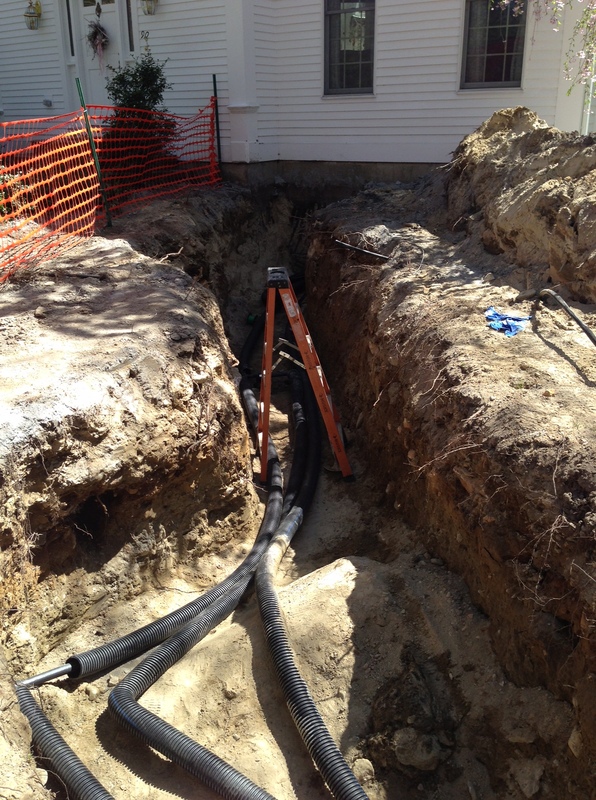 While the holes themselves and the pipe connecting them only required a 5′ wide trench, there is a ton of material that comes from both the drilling and the trench that ends up taking up and piling up on the rest of the 50’x30′ space. When everything was buried and that side of the lawn leveled out, we ended up having a lot of left over dirt which was spread out and dumped and packed in a different 20’x20′ area in our woods (yes we have a lot of acrage). I must tell you, I was a bit freaked out by the damage to our lawn at first, but after only a few months you won’t even know drilling actually happened. Nature repairs itself quite quickly! The drilling equipment was quite large. 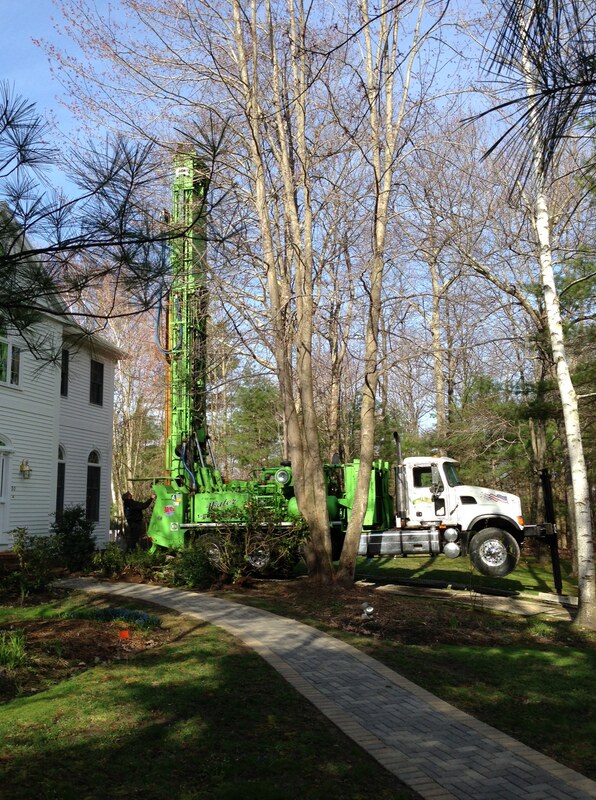 The drilling was done in late April and our yard was still quite muddy from the Spring thaw. While they did put boards down on the lawn they left some deep tracks driving in that had to be repaired in the front of our lawn. Also notice how close to the house they had to get. This was fine btw! This is the material left over from 1 borehole drill. Here is the pipe they put into the holes. Here is the trench they had to dig to connect the boreholes together and feed it into our house. 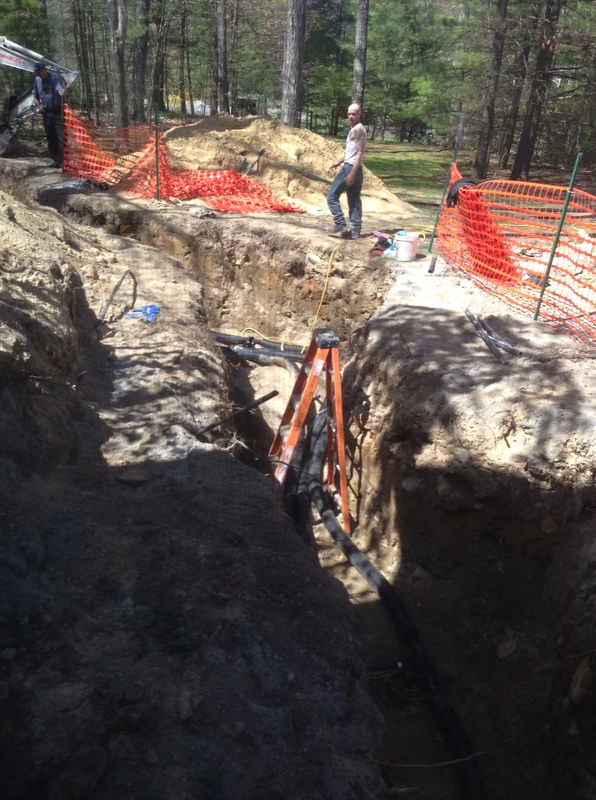 The trench was about 5′ deep and about 5′ wide. 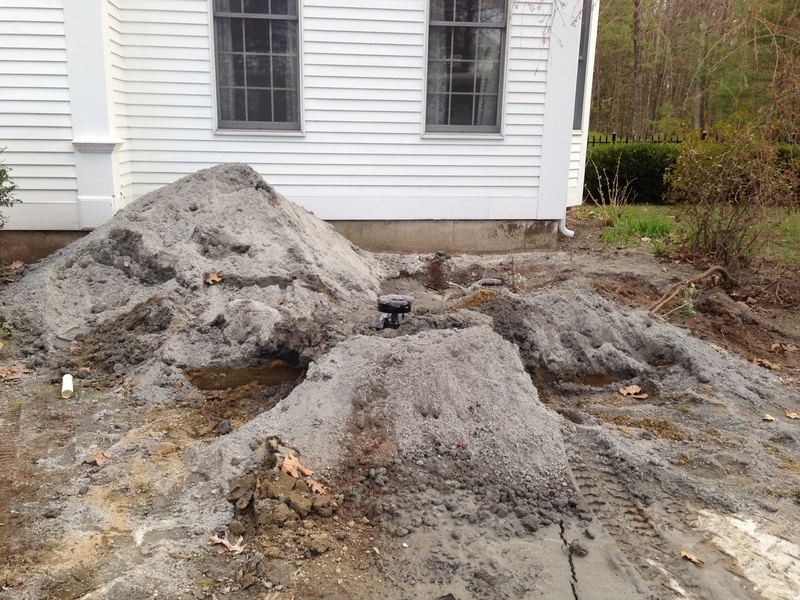 They also drill into your foundation 5′ down to get the closed-loop pipe feed into your home.